In process. I tend to glue things up in stages. Step #3. In step 1, I glued the bottom shelf to the right side. Step 2 included gluing the lower divider and middle shelf to the right side. With step three, shown in blue, I glue the upper divider and what I call the sub-top to the right side. A problem. As frustration set in, I did not have the clarity of mind to grab my camera and record this problem. 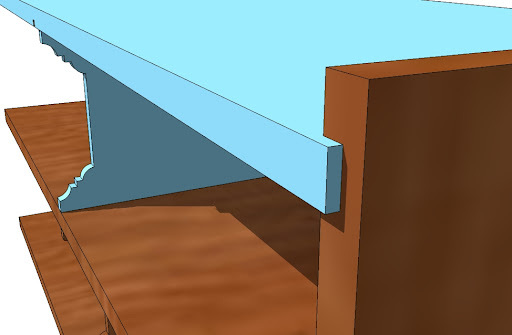 But, you can get the gist of the situation with this SketchUp drawing. As I positioned the slightly warped sub-top in place, it didn’t line up with the side (illustration above). While tugging on this board, hoping the warped edge would properly engage the dado, the glue started to set up – making it even harder to correctly position it. It was at this point that I started to loose it. The glue in the dado was setting up and glue in the divider dado was starting to run down the side of the divider. I use Elmer’s Carpenter’s Wood Glue. This is the glue my Dad has used and it has been my glue of choice for almost 30 years (even though there are many other high tech adhesives for woodworking). This glue begins to set up almost immediately, allowing very little time to make fine adjustments. At times, I have been impressed with it’s bonding power. But, it may be time for me to consider glue that has a longer open time. If you have strong feelings about the glue you use, leave me a comment and tell me why you like it. I was able to get one of my beefy pipe clamps out and pull the sub-top into alignment and everything is OK. But, this glue-up was unnecessarily stressful. Consider a new glue – one that has a longer open time. With dado joints, spread glue in the dado with an artist’s paint brush. I normally do this, but this time I simply ran a bead down the center of this thin dado; but the glue would not have run as much if I had spread it onto the walls of the dado. Say a prayer when attempting a glue-up like this so that maybe with the Lord’s help, I can remain calm. Success. The glue-up this morning. The left side has been attached and the basic case of my project has been assembled. This evening, I plan to work on the face frame and have it attached by Saturday morning. Then it is on to the base including the bracket feet. As I started to write this, I realize how limited my glue knowledge actually is. I almost always use Titebond (I have some memory that they've come up with a longer open time version.) I stay away from Gorilla Glue (which has a longer open time) but I have used epoxies that have a very long open time. I can't remember the brand name. I'm sure Fine Woodworking would have a bunch of articles. BTW, how is your planer situation? Funny you should ask. About two weeks ago, I had researched a few planers to check out. I was about to begin the process of thinning my mahogany down to 1/2″ for the dividers and really needed one. I had thought that maybe I could sneak a planer by my wife justifying the cost as a much needed tool in my shop. I sell flooring for Mohawk Industries and business is very, very slow right now. Not the time to buy a planer, but it will be my next purchase. I was thinking, if your travels ever bring you up this direction, I'd be happy to give you my (not-so)old Delta lunchbox. I'd be willing to ship it as well, but I think the vagaries of shipping costs would make it a wash. Anyway, keep it in mind. Let's hope 2011 is a better year in a number of ways! JEFF!!!! Put out your hand. Don't EVER, EVER, EVER compare yourself to “Norm.” I love the show, however he pitches his knowledge and know how in a very unrealistic fashion. 150K worth of tools, huge shop, 40 years experience, and a TV editing crew. We can all learn, but certainly don't compare. Glue-ups are ALWAYS stressful. I used to make an announcement to my wife that said, “wet glue, don't even think about talking to me.” Finishing has the same effect with me. They are the two time sensitive issues in WW. I too use titebond glues. TB 2 and 3. Christopher is right, FWW must have a comparison somewhere. I HATE gorilla glue, unless I need to fill some major gaps. As far as the process goes, based on your description, I would offer this one piece of obvious advise that took me WAYYYYYY to long to figure out. Gravity is your friend and worst enemy. 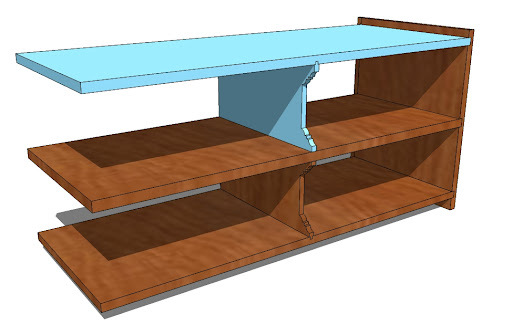 Personally, I would have put the cabinet on it's side, and worked your way from the bottom (which is the side laying on the bench now) up. In that configuration, you can do it all at one time. This is a tricky one regardless. Take the bottom, middle, and top pieces. 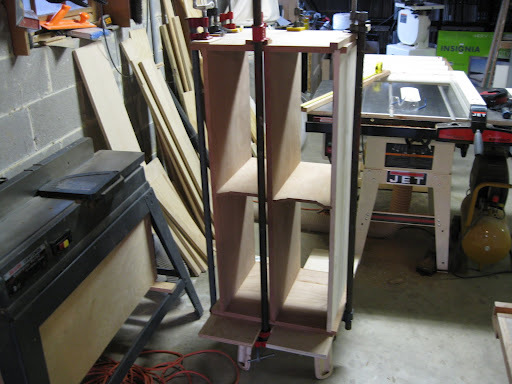 Put your two beautiful vertical dividers in and clamp them together as one piece. Then take that unit and put it into the dado on the sides. 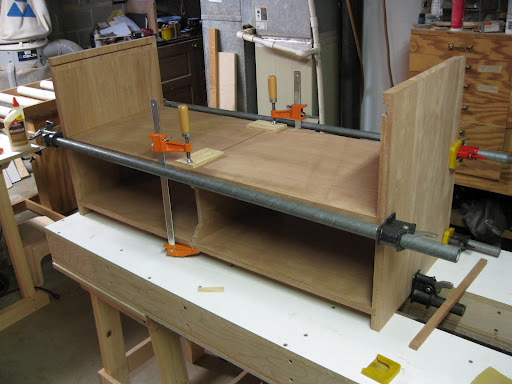 Take off the clamps for finessing/pounding/clamping the sides, and then slap the top (other side piece) on. Now check for square and reclamp so that it looks just like your final picture. In my humble (yet outspoken opinion) spreading the glue is most important where it can run. Your final note to self section already shows your ready for the next glue up. Indeed you HAVE learned from this one, and the next one will be that much easier. And lastly. NEVER buy yourself tool right around the holidays! I know I have a really sneaky wife that has supported my tool addiction for years. You never know what might be under the tree. I'll recommend Titebond III. Though I'm a 15 year user of Titebond II, I'm quickly becomming a Titebond III fan due to it's longer open time. You may also want to try the Wood Whisperer, as his glue advice is spot on. Good luck with the completion of the project. Christopher – I am going to look into shipping costs. That is a very generous offer. I'll try to email you. Jason – too funny! I actually miss Norm. You are right about him having every woodworking luxury imaginable. I can relate to your comment about alerting the wife when glue up commences. My wife sometimes goes to the far end of the house when I do that. And thanks for the tip about the order of gluing components together. I had considered a form of that, but I chose to keep it simple. Plus I don't have anywhere close to the number of clamps you have :). DP – Thanks for the comment. I'll look into that Titebond III and I think I remember seeing a glue review in FWW.